♥ Available exclusively at The Toy Shoppe! We will, with your authorization, automatically charge a pre-determined amount to your VISA, MasterCard, Discover or American Express charge card each month on the same date. If you prefer, you may send a series of postdated checks instead of using a charge card. For example: AMC $50.00 for 4 months would require four $50.00 checks each dated one month apart. AMC monthly payment plans require that a payment be made each month and your order will ship when paid in full. Applicable shipping costs can be included with your payments. Payment plans longer than 6 months are charged a one-time processing fee of $12.00. Please call us toll free 1 800 447-7995 if you have any questions. Select your free gift then click the button below to continue. Personal Buyers Service... Need help? Have a question? Click here and our friendly staff will be glad to contact you to help! We also accept PayPal...Contact us for details on to order from The Toy Shoppe using PayPal. Available exclusively at The Toy Shoppe. 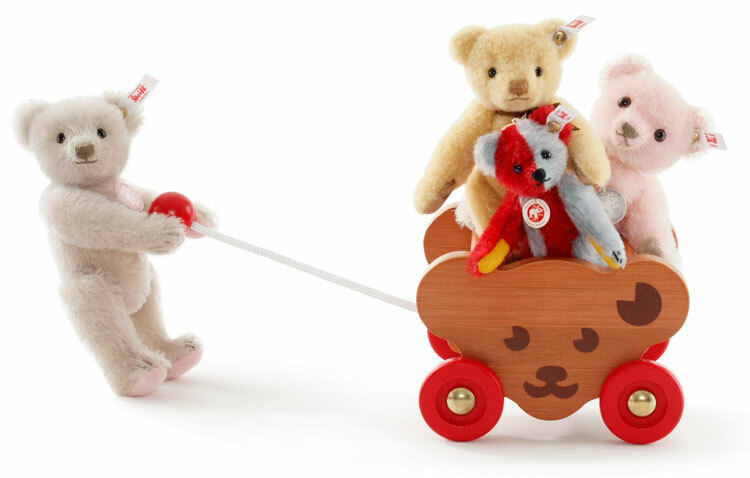 We're excited to bring our collectors something very special... our new Steiff Bear Cart. This collectible wood toy is fun AND functional, a playful accessory for all of your Teddy bears and dolls. The Steiff Bear Cart is a limited production edition available only at The Toy Shoppe. Worn by Steiff friends for almost half a century, the Steiff bear head paper chest tag was - and, still is - a token of happiness recognized by children everywhere. It is also a sign of quality for their parents. The happy bear face was the inspiration for this special accessory as both side panels are carved into that friendly shape. 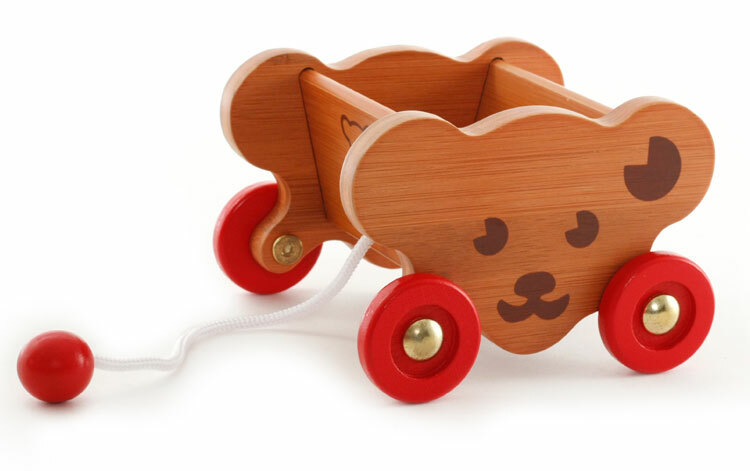 Our Bear Cart brings back memories of so many wooden pull toys Steiff created over the years, yet is unique in that it pays homage to Steiff through their own iconic design! Designed with all the appeal of a vintage toy with it's little pull string, here is a toy worthy of Steiff. 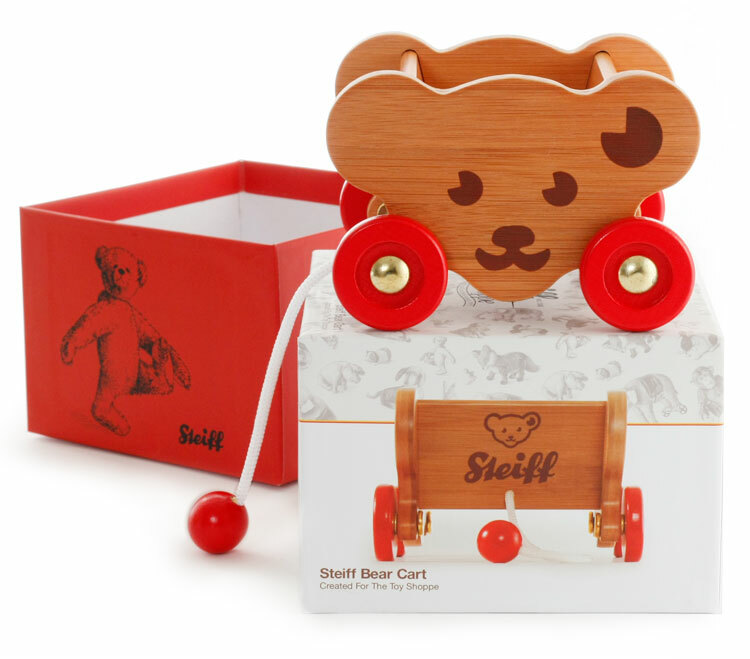 The accent of Steiff red on the wheels, the world famous Steiff logo emblazoned on the front and back, that fun and happy bear head... the Bear Cart is unmistakably 'Steiff' from every angle. The Bear Cart is artfully crafted of durable bamboo in a natural finish. It measures 3.75 inches tall, 5.5 inches wide (side with bear face) and 4.5 inches deep, a terrific size for display or for play. This is a working toys with wheels that roll it all around. The inside seating area can hold a number of small items making it functional as well as decorative. Need a smile? 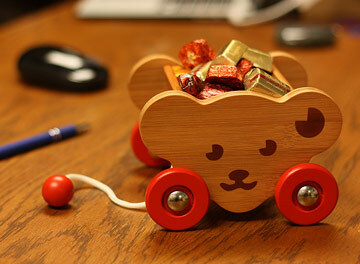 Just keep your wooden Bear Cart on your desk at work to make the day more fun! 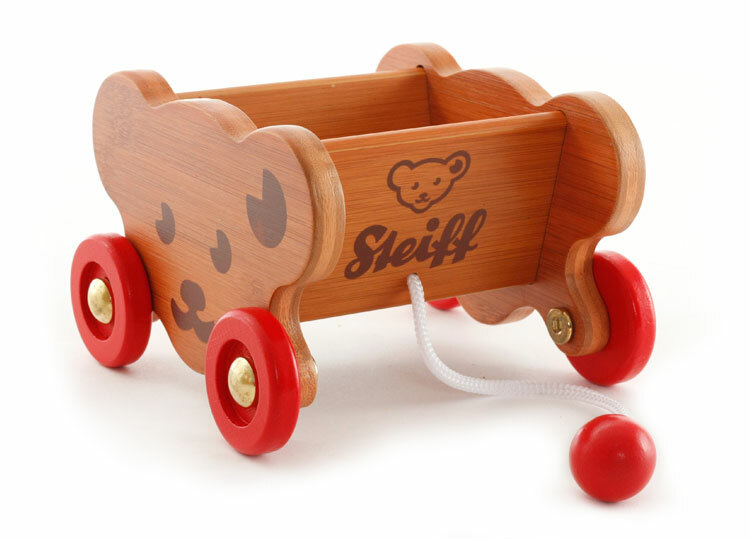 Crafted to be enjoyed by children ages 12 months and older, our Steiff Bear Cart is a wonderful edition to share your love of Steiff with your children, grandchildren and friends. It also makes an amazing accessory for the Teddy bears and dolls in your collection. Your display will light up with this accessory! 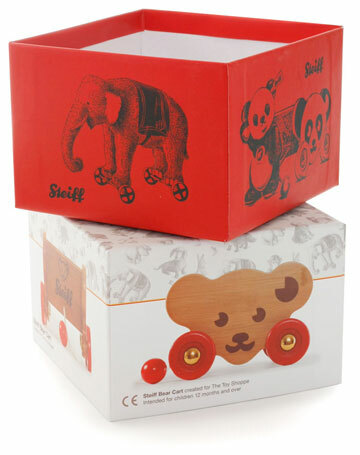 We know how our collectors value their Steiff boxes so we spent extra effort to design the best box ever for our cart! 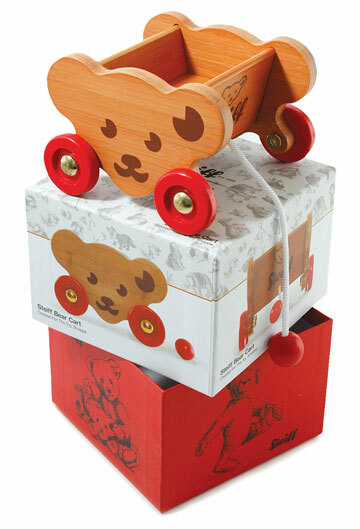 Your Steiff Bear Cart will arrive neatly packaged in a custom-designed, heavyweight box. Every inch has been designed with the Steiff collector in mind. Solid and durable, it makes a terrific place to store your Steiff tags, certificates, or maybe some personal treasures. Open it up and your box lid can serve as a bench for your bears or a stand to display your cart (as pictured above). Pull out the illustrated bottom of the box to make a cozy little spot for your smaller bears to snuggle and sit upon your shelf. We know you will appreciate the thoughtful touches of detail such as Richard Steiff's beautiful animal illustrations. Please note: dolls, bears, friends and other accessories shown in photos are sold separately. Suitable for ages 12 months and older. With this statement, company founder Margarete Steiff established Steiff's commitment to quality. For over a century, this has remained the Steiff motto. As the second oldest German toy company still in existence, Steiff has had a very influential role in how the world plays. Margarete Steiff designed her first soft-filled fabric toy animal, an elephant made of felt, and began the family business. Margarete's nephew Richard Steiff studied art in Stuttgart and brought a heightened sense of realism to Steiff designs. In 1902, Steiff created the 55PB, a mohair plush bear that is the basis for the modern Teddy Bear we know today. In 1902, Clifford Berryman, a well-know cartoonist for the Washington Post, made popular a caricature little bear with American president Theodore Roosevelt: thus, the "Teddy" bear was born. Children and adults have made the Teddy bear an iconic toy, universally loved and adored. 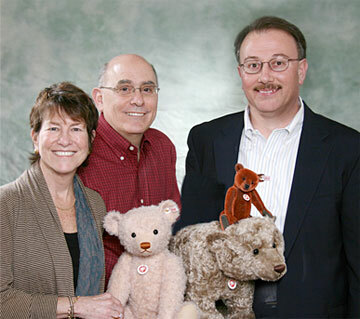 Over the years, Steiff's focus on delighting children with realistic soft animals brought them fame around the world. Their innovations in airbrushing, choice materials and manufacturing have created toys that are prized everywhere. Steiff continues to create Teddy bears and other animal friends at their factory in the small town of Giengen, Germany. After 125 years, Steiff continues to lead the world in the finest Teddy bear designs and manufacturing. Their commitment to quality and excellence has brought joy to generations around the world. Since our doors first opened in 1975, The Toy Shoppe has been your premier Steiff store! The very first box of merchandise that we opened for our shoppe in 1975 was filled with Steiff Teddy bears and it was exhilarating! We established The Toy Shoppe way back then to bring fine dolls and Teddy bears to our collectors. With their long tradition and commitment to excellence, Steiff bears are a natural fit for our shoppe. In the early 1900s, Richard Steiff created the modern Teddy bear as we know and love him today. Steiff's continued innovation and commitment to quality has touched generations of children around the world. Over the years, Steiff collectors in the USA and around the world have turned to The Toy Shoppe for their Steiff bears and animals. Our selection is unmatched. We have worked closely with Steiff both in North America and in Germany to design exclusive editions for our collectors that are compelling to Steiff collectors and Teddy bear lovers alike. We travelled to Giengen, Germany to search for inspiration deep within Steiff's archives, their treasure trove of past editions that reaches into their rich history. Maximilian began our Steiff Teddy bear family over a decade ago and since then we've created a wide array of Steiff editions exclusively for our collectors. From Traveller to Little Bear to GrandPapa to Chub-ling to Polar Cub to little Jocko, each one has brought a unique character of Steiff design often introducing innovative techniques or materials in their production. Collectors have adored our Toy Shoppe exclusives by Steiff! We at The Toy Shoppe are honored to be the premier Steiff shoppe in North America. Our staff is very friendly and knowledgeable and eager to assist you. Just call us toll free 1 800 447-7995 and we will be glad to help you discover that perfect addition to your Teddy bear collection or that perfect Steiff gift for a child, a baby or even yourself!